Star Nomad II: Introducing the Starborn Federation! In the universe of Star Nomad II, three major factions vie for supremacy through conquest. Smaller factions play their roles among this overarching theme of large scale dynamic conflict. During times of crisis, there’s money to be made and glory to obtain. This is the sandbox in which players will change the course of the universe through their actions. The Starborn Federation splintered from the rest of humanity over their desire to micro-manage human evolution by pushing the boundaries of genetic manipulation. Their core mantra is that without artificial selection, humanity will slowly fade away in time and succumb to the vast cosmos. As such, they extract peak performance from genome manipulation rather than via artificial enhancements (drugs & cybernetics). They’ve also recently started a program to seed habitable worlds with genetic material to manipulate the natural course of evolution on alien ecosystems, to create designer species to suit their whims. The upper echelon of the Federation believe they are now Gods in all but name. One of the negative consequence (which isn’t publicly discussed) of such aggressive genetic manipulation or fusing bio-modules is the risk of experimental failures. This leads to a sub-class of failed experiments that serve as slaves for the “perfect” masters. The Federation bans trading of Cyberware, Implants, Datacores & Drugs within its sphere of influence. Their ships are visually advanced with crystalline based armor that provides less structural strength but is highly resistant against energy weapons. Ships are equipped with the most advanced shield generators with high capacity & fast regeneration. 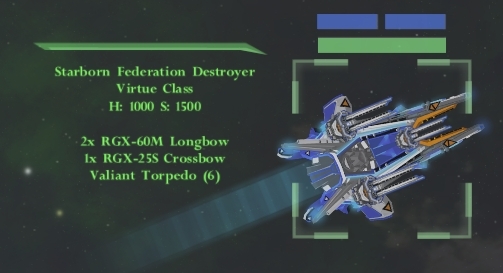 The weapon of choice for most Federation ships are modified Railguns with higher velocities than civilian models, leading to an excellent mix of accuracy, range and damage. Their weakness is the lack of area damage weapons, but the high damage potential of their Railguns makes up for this flaw. Due to the nature of large Railguns being weak against small & fast targets such as Corvettes or Drones, the primary fleet defense against these threats is the Strike Mk1, a fast & agile fighter drone with a rapid fire weapon capable of quickly taking out small light-armor targets. In large numbers, they are also very dangerous against larger armored ships such as Cruisers. 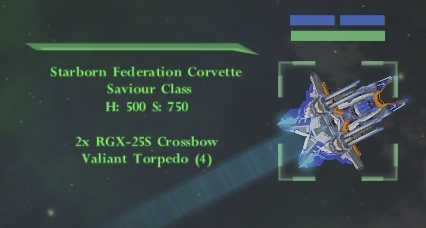 The Saviour Class is one of the fastest & agile Corvettes. It’s high evasive capability ensure that large main weapons have great difficulty landing a direct hit. This enables the Saviour to impact in a large fleet battle by deploying its twin RGX-25S Crossbow Railguns with its high precision and DPS to take out enemy drones & smaller ships. Against bigger targets, the Saviour can deploy Valiant (Multi-Warhead) Torpedo to deal major damage. Take the Saviour, add more armor & firepower without sacrificing too much speed & agility and you get the Virtue Class Destroyer. Equipped with twin RGX-60M Longbow Railguns for large threats and a RGX-25S to provide precision against small targets, the Virtue is a very flexible fast attack ship. With the standard loadout of six Valiant Torpedos, even Capital Ships have to respect the Virtue. Cruisers are regarded as a heavy trade-off vessel, in that they are too cumbersome to evade weapons fire well but lacking in the armor or shield capacity of Capital Ships. 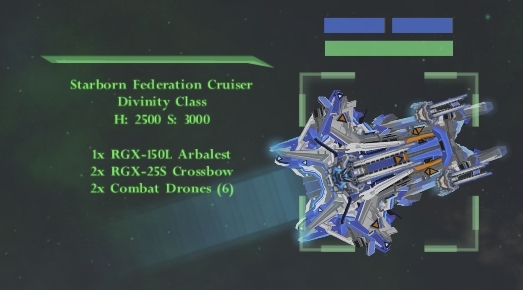 The Divinity Class combats this trade-off by carrying a large caliber RGX-150L Arbalest Railgun that can punch above its class. To handle smaller threats, twin RGX-25S and dual Combat Drones (with 6 additional in reserves) ensure it remains highly flexible in any battle. They are a major investment in time & resources but powerful Capital Ships serve as a symbol of hope & strength for their people. The Destiny Class is the embodiment of the Federation; it’s pure crystalline armor shines brightly in the darkness of space, similar to the glory of the Starborn species rising above the meek & mundane filth. 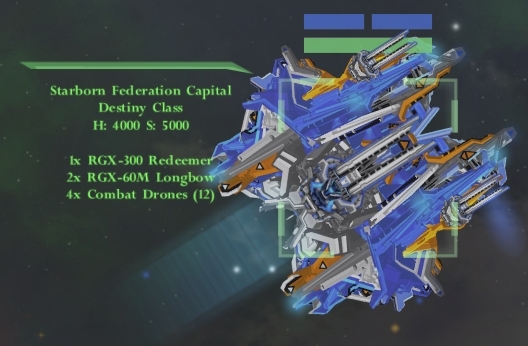 The over-sized main gun, RGX-300 Redeemer, serves two purposes: 1) it’s sheer size inspire awe/terror and 2) that nothing can resist the might of the Federation. Twin RGX-60M ensure smaller vessels learn quickly to respect the Destiny and its horde of Drones eliminates small-craft threats with maximum effectiveness. ← Star Nomad II: Firstlook at Pre-Alpha!